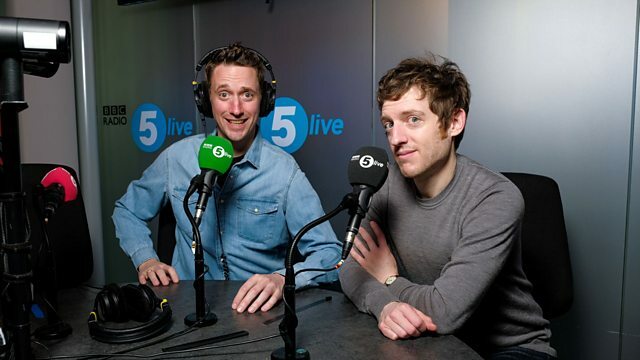 Former Radio X and Xfm duo Elis James and John Robins are joining BBC Radio 5 Live for a new Friday 1-3pm show. The pair left Global this weekend after 5 years together on Radio X. Their new show will start on the BBC from Friday 31st May. Elis already appears on 5 Live’s Fighting Talk and also presents the Feast of Football podcast for BBC Radio Wales. Friday afternoon schedules on 5 Live will change to accommodate the show, which will be made by independent production company Audio Always and produced by former Radio X and Absolute producer Dave Masterman. The station’s film show with Simon Mayo and Mark Kermode will move to the later time of 3-5pm, with Drive starting at 5pm on Fridays from the end of May. The BBC says Elis and John’s show will ‘help kick-start the weekend with a mix of comedy, fun features, guests and callers’. It will be put out as a podcast too, and the pair are also working on a separate weekly podcast which will launch later in the summer. Sounds like another reason not to tune into 5 live if you want news and sport,it really has gone downmarket and younger Aimee of late in my opinion (far too much unimportant waffle) ruined just like other BBC stations-musiciwise Radio 2 and now local radio is going the same way.Do they really have to go down the same road as commercial stations?. Whoopa! The hammer legends return! John does realise he won’t be playing any Queen doesn’t he ? Radio 5 should have saved money, and broadcast the Jo Good show from Radio London. Wow. Just when you thought 5live had gone to the dogs, the BBC kindly offer us this piece of firm confirmation. How long before they make the momumental mistake and axe Mayo and Kermode? I’m not a fan of Talk Radio but thanks to the BBC, I’m Matthew Wright strangely magnetic in the afternoon. I think it’s a terrific signing for 5Live, their Radio X show was unique not just because of their personalities but because of the way they tackled serious issues, in quite some detail and length on the podcast version of the show. Glad there’ll be now 2 podcasts as their X show was a regular Monday pod listen for me. You just have to be these days. If I were a regular on Fighting Talk I’d make sure I kept that well off my CV. This sounds dreadful – yes I am pre-judging – but if they are going to try to be funny Five Live’s track record in that department is dismal. Think Bob Mills.